Thomas Bevilacqua is a writer for Golden State of Mind, SB Nation's Golden State Warriors blog. Originally from Alameda, California, Thomas currently lives in Tallahassee, Florida where he teaches English. He holds a Ph.D. from Florida State University in English. With three NBA Championships in four years, there’s no denying the greatness of the Golden State Warriors. Led by Head Coach Steve Kerr, the proud owner of eight Championship rings, Steph Curry and company have cemented their place in NBA history of as one of the all-time best teams. And there’s no sign of slowing down. 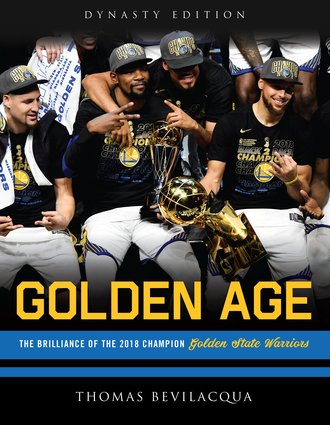 Golden Age does justice to its subject, with quality reporting and thoughtful insights on the Golden State Warriors 2018 experience. No Dubs fan’s library is complete without this great new collectible. Thomas Bevilacqua is a writer for Golden State of Mind, SB Nation's Golden State Warriors blog. Originally from Alameda, California, Thomas currently lives in Tallahassee, Florida where he teaches English. He holds a Ph.D. in English from Florida State University.